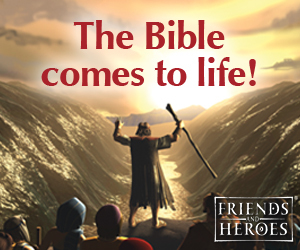 This series of lessons contains six lessons, one for each verse of Psalms 23. 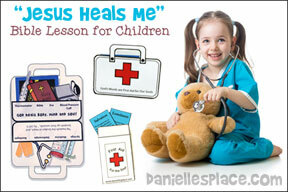 These lessons are designed for children, preschool through first grade. A sheep puppet introduces each lesson. The puppet doesn't actually say anything so the puppet skits are very easy to perform. The puppet shakes its head yes and no and also brings things to class that helps to explain the concept to be learned for each verse. 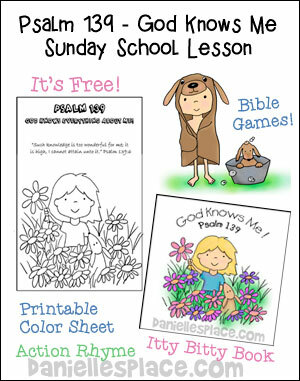 Each lesson contains a printable Bible verse card to send home with your children. 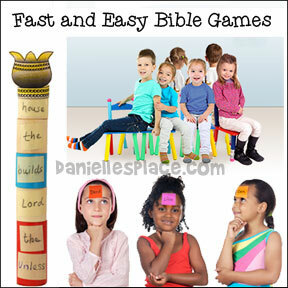 You can also use the Bible verse memorization chart to keep track of each child's progress in memorizing the verses. Print out onto card stock, write the Bible verse on the cards and make copies. God loves us and gives us everything we need. He is like a good shepherd who takes care of his sheep. Silk Flowers (You can find silk flowers at your local thrift store. Be sure to remove all the plastic parts leaving on the silk part. Wal-Mart also sells flower parts and pieces that have fallen off of their silk flowers in bags for a discounted price. Look were they sell remnants of fabric. 2. Cut the sheep picture out of the middle. Glue the picture to the middle of a piece of construction paper to make a frame. 3. In class have you children color the sheep picture and then glue flowers to the frame. 3. Explain what the Bible verse means. These bookmarks are available in both black and white for coloring and ones that are already colored that can be used as a rewards for memorizing the Bible verse. 1. Before class print out the bookmarks onto cardstock (Thick paper) and cut them apart. 2. In class have your children color them. Use these bookmarks in an activity listed below. Preparation: Draw a picture of sheep in a green pasture, with a lake or stream, some shade trees, and a shepherd. It doesn't have to look good. It should look like a child drew it. 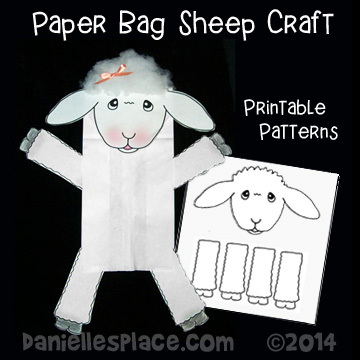 A sheep puppet is used for this lesson. You should be able to open and close its mouth so that it can hold things. 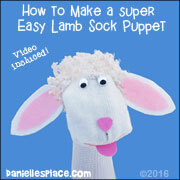 You can make your own sheep puppet from a white sock. Go to the Puppet Crafts Page for directions. Teacher:Good morning class. I have a very special guest I would like you to meet. (Pull out your sheep puppet.) Class, this is Woolie. Teacher: Woolie says, "Hello, It is nice to meet you." Teacher: Oh, Woolie, that is a lovely picture. Did you make that yourself? Teacher: Is this a picture of you, Woolie? Teacher: Oh, that does look like you. I see that you drew a lot of green plants. You must live in a very pretty place with lots of good stuff to eat? Teacher: Oh, and the trees are very big and green. They must be a great place to go when it gets really hot. They can protect you from the hot sun. Teacher: And I see that you have a nice cool stream to drink from? Teacher: Is this a picture of the Good Shepherd? He looks very nice. 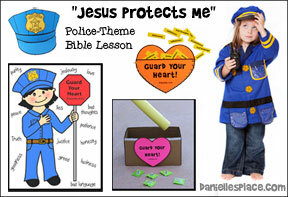 He must do a very good job of protecting you, and making sure you have everything you need? Teacher: You know, the Bible tells us that God is a lot like a shepherd. David wrote a psalm or song that talks about how God is like a shepherd. He said that God is his shepherd because he gives him everything he needs. (Open your Bible to Psalm 23:1 and read the verse.) "I shall not want" means that we have everything we need. God is watching over us like a shepherd watches over his sheep. He keeps us safe, makes sure we have enough to eat, and a place to live. He takes care of all our needs. Woolie, thanks for coming to visit us this morning. I hope you come back next week. 2. If you have young children, cut out the patterns before class. To make cutting faster staple several sheets together so that they match up and cut them out all together. When cutting out the feet don't worry about cutting around each bump and indent, just cut them straight. 3. Fold in the two corners of the bottom of the bag that will be the bottom of the sheep's head and glue them down. 4. In class have the children glue the head on the bottom of the bag and the feet on the inside fold of the bag. Also have them glue on some fiberfill or cotton balls and a bow on the head. 2. Cut pipe cleaners into one inch pieces and fold them in half. Glue them onto the sheep's body (pompoms) with the pointy ends of the pipe cleaners sticking into the body. 2. In class have your children color the display boxes and then glue them together for them. 4. Give them each a piece of green felt to glue inside the bottom of the display for grass. Show the children were Psalm 23 is in their Bible. Tell them that it is located just about in the middle of the Bible. Close your Bible and let the children try to open it to the 23rd Psalm. 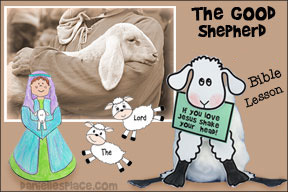 Have them place the shepherd and sheep bookmark in your Bible at the 23rd Psalm. 2. In class give each child a piece of paper and a pencil. Have them take turns throwing a die. If they roll a one, they get to draw the sheep's body. If they roll a two, they draw the sheep's ears, etc. The sheep parts page tells which parts the children should draw according to which number they roll. If they roll a number that they already rolled, they don't draw anything on that turn. The child who draws the completed sheep first wins. 3. If you have a lot of children in your class, break them up into two teams. Place a big sheet of paper on the wall for each team and have each team work on drawing a sheep. Note: You can buy Jumbo Foam Dice from Amazon to play this game. 4. Play "Pin the Tail on The Sheep"
Play just like "Pin the Tail on the Donkey" except use a sheep. 6. Play "Dress the Sheep"
Before class draw a picture of a sheep on a large piece of paper. In class have the children take turns telling something that God gives us or how he takes care of us and then have them roll the die. The child gets to glue that many cotton balls onto the sheep picture. Keep playing until the sheep is completely dressed. You can also have the child say the Bible verse before he rolls the die. Stand up and shout and clap your hands. God loves us today, hey. We are studying Psalm 23 in our Super Sundays. 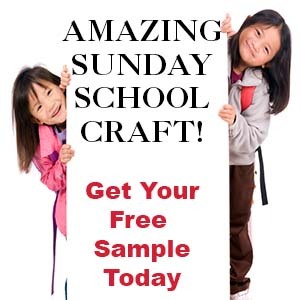 Super Sundays are our once-a-month combined classes with all age groups together (toddlers to 12 years old for a total of about 20 children). We did the first lesson today. We had a wonderful learning time. Thank you so much for sharing your lessons! 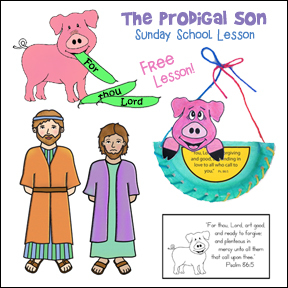 We used the puppet show, I Shall Not Want Sheep Pictures (younger kids), The Lord is My Shepherd Displays (older kids), Pin the Tail on the Sheep game (younger kids), and the Draw the Sheep game (older kids). (1) I asked one of the older kids to play Woolie and will have a different older student help with this each Super Sunday. The younger kids enjoyed Woolie and the puppet show, and the older kids look forward to being puppeteers! (2) I asked a church member to dress up like a shepherd and talk to the children about what a good shepherd is like and what sheep are like. I gave him the info you have listed in your Good Shepherd lesson, and he did some further research on the Internet as well. He played the role well, and the children asked him lots of questions. Before the shepherd came in, we made a list on the white board of all the children knew about shepherds and sheep. After the shepherd's talk, I asked the children what we could add to the list. It was wonderful to see the list grow because of the shepherd's talk! (3) For the older children, I made a sequence game for the verses of the entire Psalm. I printed a verse per card for a total of 6 cards in each set. 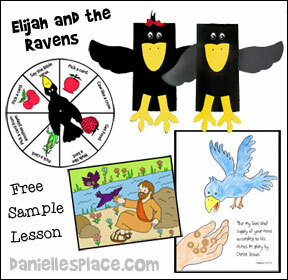 I divided the children into pairs or trios and showed them how to locate Psalm 23 in the Bible. Then we had a race to find Psalm 23 in our Bibles and put the verses in order. After doing this a couple of times, some of the groups were able to put the verses in order without looking in their Bibles! I've made up a second set of cards with phrases rather than complete verses to make it more challenging next time. Thank you again for your lessons, Rebecca. I really like your site! And today I used some of your Lost Sheep lesson with a few extra things that I would like to share. 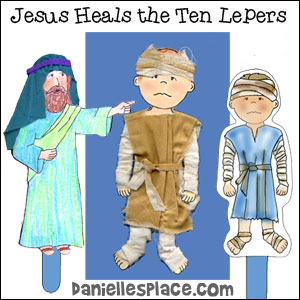 I sat my two to five year olds down, 15 today, and we talked about what shepherds do. I told them they were going to be shepherds today and they needed to find their sheep that were out in the fields. Every shepherd went searching for 2 sheep. Then they met back on our carpet-the pen. We sang a song to tune of "Frère Jacques". Then we read the "Peek a Boo Lost Sheep" book you recommended and I added some ad lib to make it a bit more dramatic as I read it. Then we woke up the sheep that slept in the pen overnight while we read the book. We talked about where sheep sleep at night and why. Then we talked about what the sheep needed this morning for their rumbling tummies. They went to find some grass. I laid down green felt pieces and used blue felt for water. I told them that the sheep had been feeding and drinking all day and the sun was going down. I asked them "Where does the shepherd take them now?" Back to the pen we go.